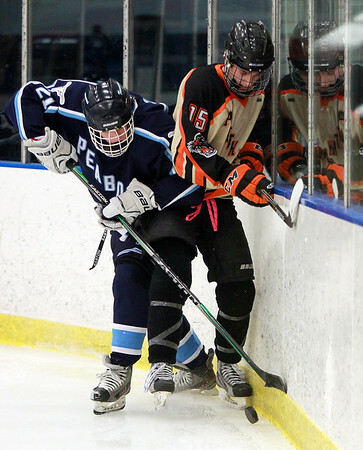 Beverly senior captain Jesse MacLaughlin (15) scraps with Peabody senior forward JT Eason (21) along the boards for a puck in their skates during the second period of play at the Rockett Arena at Salem State University on Wednesday afternoon. The Tanners bested the Panthers 3-2 in NEC hockey action. DAVID LE/Staff photo. 1/14/15.